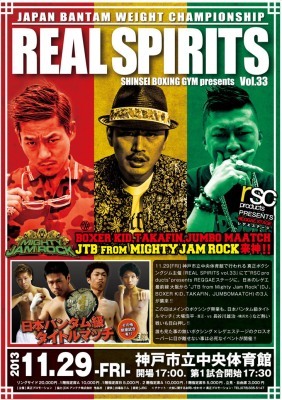 Friday November 29th sees Shinsei putting on "Real Spirits Vol 33", a show headlined by Kohei Oba defending his Japanese Bantamweight title against Yuji Hasegawa. Oddly it seems that it won't just be boxing on the show but also a musical performance by "JTB from Might Jam Rock" whilst we're also reading that a documentary will be involved in the show. Unfortunately when it comes to the poster it seems to be more about the music than the boxing, a bit of a disappointment in all honesty. It's got the details of the show and some of the fighters on it but the sheer fact that the musicians takes up half the poster space is a bit too much for us.